Phonics is a popular method of teaching reading and writing. Children are taught to associate particular sounds from spoken English with letters or groups of letters, as well as how to blend the sounds of letters and letter groups together in order to read out written or printed words. Note: Of course, not all English words follow phonics rules, and other words are so common that reading fluency is best achieved by, by learning recognize these "sight words" (such as words on the Dolch sight word list). 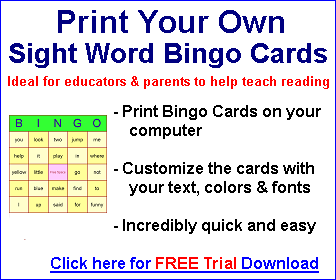 This web site provides a free resource for a variety of classroom phonics bingo games - each of these games is designed to teach or practise a particular phonics technique. Additionally, we provide a list of phonics education resources that you may find helpful.